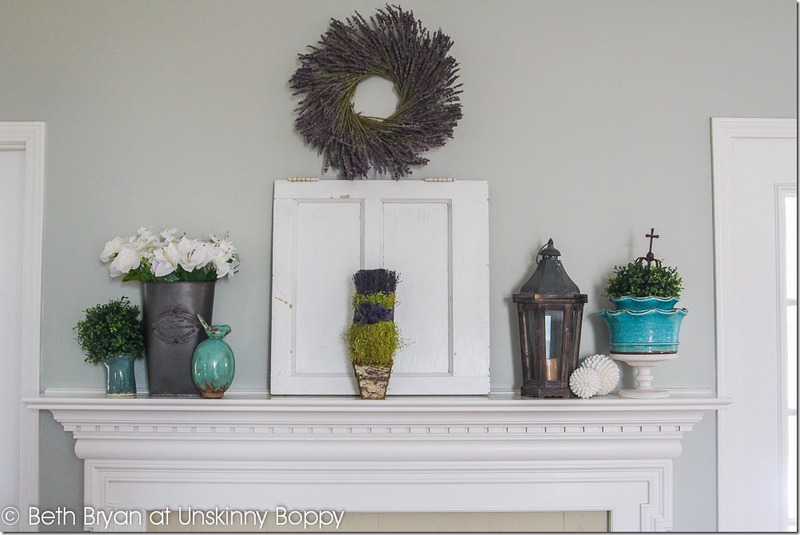 I got all gung-ho last week and started painting my mantel with Annie Sloan Chalk Paint. The color is Country Grey ASCP that I won at Haven last year, and the only thing I’ve used it on so far have been my Funkins for my Fall porch decorating. 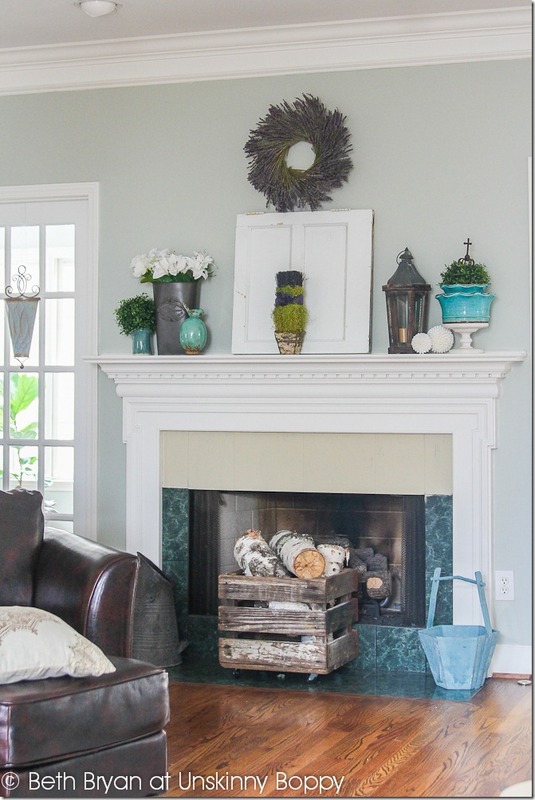 I was really hoping the Country Grey would be just what my 1990’s hunter green faux marble fireplace surround needed for a quick update, but when I stepped back to admire the top half I didn’t really like it too much. It’s the color of a putty colored Office Depot filing cabinet. Not really what I’m going for in the middle of my living room. 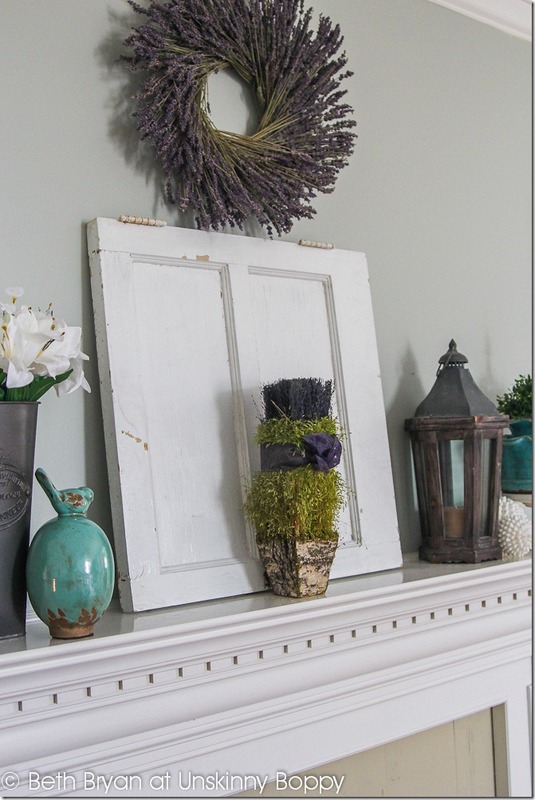 So, instead of wasting perfectly good Annie Sloan paint on something I didn’t love, I stopped in my tracks and decided to come here to get your opinions. 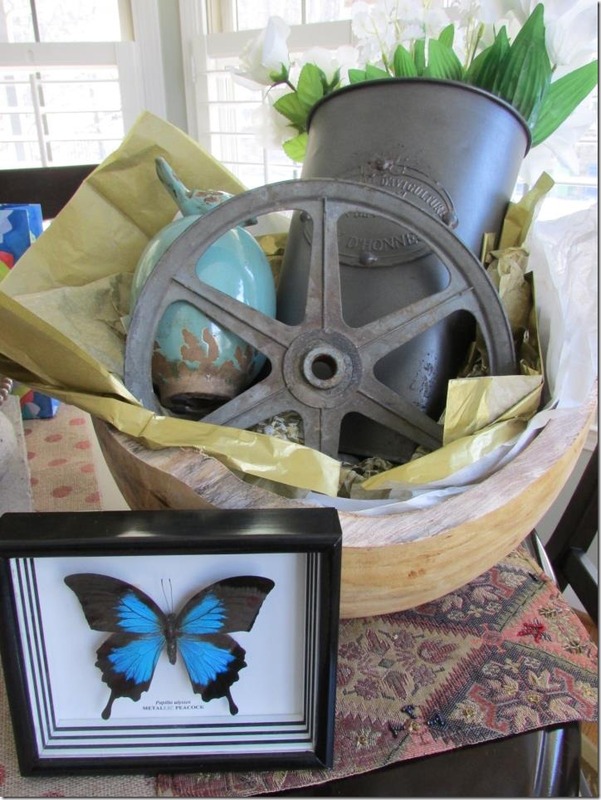 Before we talk about that, lemme sidetrack for a minute and say that my awesome husband bought me the pretty metal bucket filled with flowers and a ceramic bird statue along with a big bowl full of other architectural antique goodness for Valentine’s Day. Some girls get chocolates and roses, I get architectural salvage and home accents. As another sidenote: I’ve always wanted one of those butterflies under glass. When Garrett saw it he got very serious and said “”MOM! I’ve got some really bad news. It’s dead.” Heh. I love that kid. Anyway, back to the mantel… The blue vase on the left was hand crafted by yours truly at the last Earthborn Studios pottery event. I love making pottery, even when all I create are crooked and weird looking pieces! In the middle is a piece of an old door that I found at a fun side of the road junk place in Sylacauga called DéjàVu 280. They had some awesome old junk in that place, and I had a great time looking through it all and bringing home a few treasures. 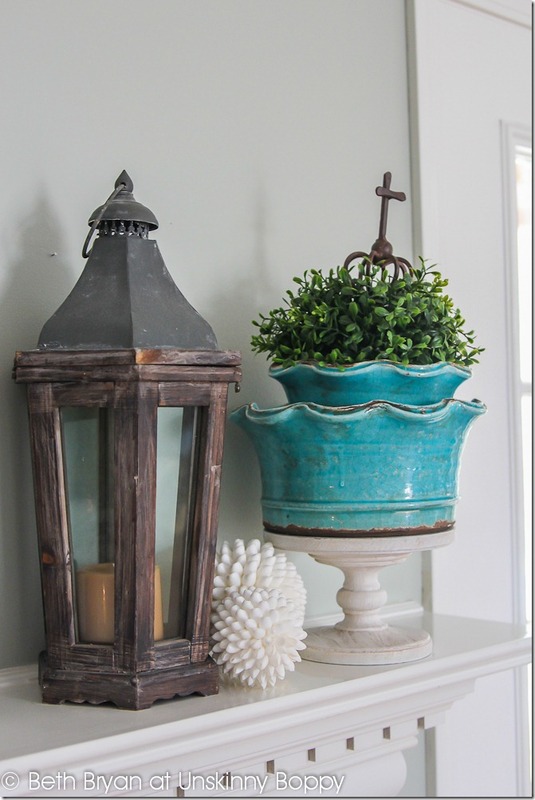 On the other side sits my trusty old Country Living Fair/ Pottery Barn lantern, seashell balls and two ruffled pots on top of a white pedestal with a crown and a cross on top. My mother-in-law bought me this cute cross (that is actually a glass bottle stopper) at Cottontail’s Market last weekend, and I thought it looked good sitting inside my boxwood kissing ball. Passover and Easter are almost here, so it fits in my Spring décor just fine. So who wants to weigh in with your opinion about my fireplace painting dilemma? WWYD, guys? What color do you think I should paint the fireplace surround? Gloss white to match the mantel? Silver Sage to match the walls? Something neutral but not so Silly Putty colored? A stone / tile makeover isn’t in the budget right now, so paint it is. So pretty!! Love the layers! I am glad you are trying this first. I have been toying with the idea myself. On mine, I have 20-year old streaky grey cultured marble. Ick! So I will be watching with interest. I agree that the color you tried is not the right one. Your husband is a smart man. The way to a girls heart is through the junk you bring them. Works. every. time. Wink wink! [As if I am totally qualified to have an opinion] Maybe a shade darker than your walls on the same paint chip, and perhaps with some sand added in to give it some texture? Or just flat … I haven’t tried adding the sand in, so I’m not sure how well that would do over your tile. I love so many of the pieces on your mantel – the bird, the cross, the piece of that old door. I have a brass fire place that I am trying to figure out how to hide/update so I can’t wait to see what everyone suggests for your mantel! I can’t even tell you how much I LOVE the lavender. I actually like the color! I think that it is clashing with the green but once that is covered it will look perfect. 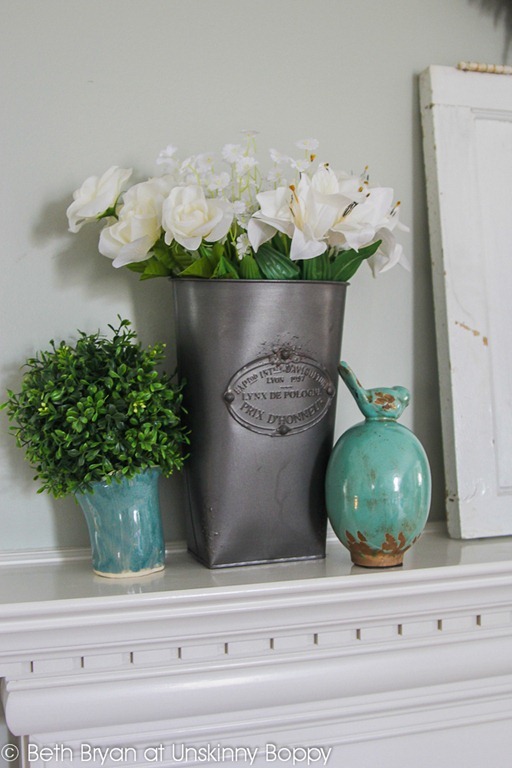 My suggestion would be Graphite with Pearl plaster, like the table done at Maison Decor here http://maisondecor8.blogspot.com/2013/02/artisan-enhancement-giveaway-get.html. I think it would be striking with your walls. Beautifully decorated mantel, Beth! I really like someone’s suggestion to do the zinc treatment on your surround. I was just using the country grey color yesterday. I liked it but it didn’t go with what I was doing, so I painted over it! Hmmm! I love it! It looks beautiful I love the bleu lol blue. And speaking of rugs I have been looking to buy some rugs lately.. anyone know any sites?